You never know who you'll end up next to on a plane. It could be a man with an "unbearable stench," a couple joining the mile-high club in full view of the cabin, or, apparently, even a man with 20 snakes hidden in his bags. That was the case on a recent flight from Germany to Russia. 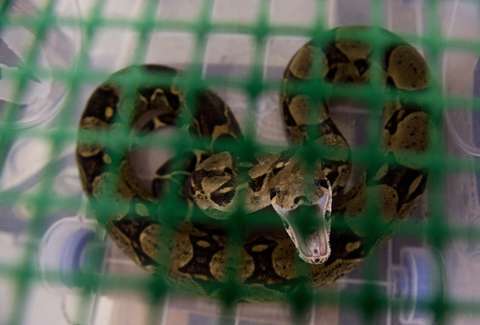 Employees at Moscow Airport discovered the stowed-away snakes in a passenger's bags upon his arrival in Russia. The reptiles were then quarantined in Moscow as a precaution because he lacked the required documentation, but they're reported to be non-venomous. Either way, though, a secret snake is a bad snake. The man revealed that he'd obtained the reptiles at a market in Germany. Apparently, it's not actually illegal to bring snakes on planes, but you are supposed to get approval for it. On the whole, though, it's best to leave snakes off planes. Or even better, just shoot them all into space.